See you later, burnished brass; bright and shiny copper is the new kid in town. What's that? You love copper so much you want to ride it? You're in luck. 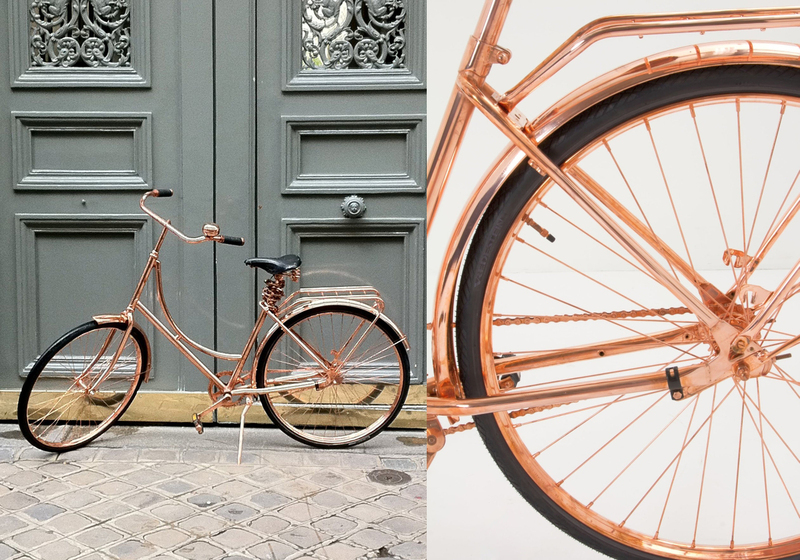 Van Heesch's copper bike is now for sale via Anthropologie. It even includes a copper chain lock and copper bell (plus handling gloves, naturally). Seattle-based duo Iacoli & McAllister have been mining the copper vein for awhile (see their Algedi table), and this year at ICFF they introduced a copper version of their Frame Coffee Table. Venerable French glass manufacturer Saint-Louis hired Dutch designer Kiki Van Eijk to make a contemporary piece of lighting; the result is the industrial-meets-Art Deco Matrice lamp that incorporates copper trusswork around a crystal bulb, with LED bulbs on the interior. Even KitchenAid is getting in on the action: The company's professional 6-quart stand mixer now comes in a satiny copper finish. Jaime Hayon designed these copper vases for Gaia & Gino with an eye on Turkish geometric motifs. We love the shot of pure copper, especially when grouped as a trio. Unveiled at 2013 Salone del Mobile, the new Husk table by Patricia Urquiola for B&B Italia features a copper tray atop die-cast legs. Toronto-based studio Castor designed its new Coil Lamp with a nifty trick: It's powered by an Apple laptop charger. In Dwell's June issue, we highlighted a selection of super-metallic objects for the home, the majority of which were made from copper, 2013's metal of choice. The current finish for metals strays from the patinaed, rubbed, waxed, and generally muted finish that's held on in the design market for the past decade. What we're now seeing at the design fairs, from Euroluce to ICFF, is a gleaming, smooth presentation, particularly with copper. Here are a few more editor-approved picks to get the look.